San Francesco beach in Forio is a must-see in Ischia. Photo by Alex Vaina. Ischia, an island off the coast of Naples and near its more famous neighbor Capri, is a beach lover's paradise. There are fewer things I enjoy more than running my fingers through the sand (which is different depending on which beach you go to) and walking at the edge of the shoreline, so my feet just barely get wet. A vast collection of sea glass, tiny tiles that wash ashore, and the sand that gets into my son's hair, ears, and other bits serve as reminders of our glorious days on an Ischia beach. We usually head to San Pietro beach or Spiaggia dei Pescatori because they are right outside our door. They attract a lot of tourists because they are centrally located in Ischia Porto, the hub of the island. Although these beaches have their charms (one, of course, is location and the other is their family friendliness with relatively calmer waters), there are others on the island that will take your breath away and offer up beach days like none you've ever experienced. 5. Baia di Sorgeto – Looking as though it was carved into a mountain, this is an unusual beach. Even though there is little sand, there are rocks on which you can stretch out. But what makes Sorgeto an attractive spot is the thermal waters and fango (mud). Said to have healing powers, people come here in the hopes they can clear up acne, iron out wrinkles, and maintain a youthful glow. You'll see people painting their skin with the warm green mud that you can usually pick up from a local salesperson, and some tourists have lamented that they didn't buy jars of the naturally heated dirt from those selling at Sorgeto. Apparently, the same products are more expensive when you go into town. It can be difficult to get to Sorgeto, and many prefer the water taxi because it requires no walking and provides great views of other parts of the island. You can take a bus to Panza and walk the rest of the way, but it's a bit of a hike and there are many stairs before you arrive at the bay. Also, the water is thermal, which means it can be pretty hot in spots, and the rocks are slippery and jagged, so it's not the best place for little kids. 4. San Francesco Beach – Located in Forio, which has Arab influences in its architecture, this beach is idyllic. The rounded domes of some of the town's buildings are visible from the sand. The views of the green mountainside and pastel houses are unmatched. To look at the beach from above is to look at a painting. A traditional beach, there are places from which you can rent lounge chairs and umbrellas, as well. If hunger strikes while snoozing on the beach, there are great restaurants – perfect for picking up a pizza or sampling Ischia's fresh seafood – and snack shops. 3. Cartaromana – If this was a list of the best views of the island, Cartaromana would be No. 1. Between Castello Aragonese and the Sant' Anna cliffs, this beach allows you to snap amazing photos of the castle, arguably the focal point of the island. There are also thermal waters here, which permit swimming, even in winter. But I wouldn't recommend getting wet on this humid island during the colder months. You may never heat up again. Here again you will find great restaurants for sampling Ischia's cuisine at a range of price points. Some natives enjoy bringing their boats here and stopping for a bite to eat. 2. 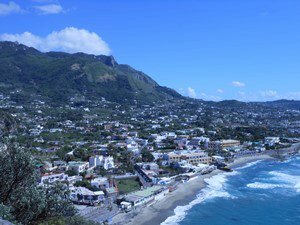 Maronti – At 3 km long, Maronti is the largest and best known of Ischia's beaches. In recent years, the beach has been plagued by reports of water pollution. But the natives have taken steps to clean up the place. And it still offers glorious views and experiences. Of course, there is a fair share of restaurants and hotels lining the shore. What is more exceptional, however, are the natural wonders, including more thermal waters and fumarole, which is an opening where hot sulfurous gas escapes and is a remnant of Ischia's past as a volcano. My husband and relatives have actually cooked fish and potatoes in the sand at Maronti, thanks to the fumarole. At the end of the beach (or the start of it, depending on how you see things) is Sant' Angelo, a fishing village, whose symbolic large rock formation makes for a great photo op. The water taxi from Sant' Angelo can bring you to Maronti's beach. 1. Baia di San Montano – Perfect for families, this bay offers calm shallow waters in shades of sapphire and emerald. And the water is naturally warm. Closed off between Mount Zico and Mount Zaro, the sand is exceptionally soft, and the scene offers tranquility like no other place on the island. Like everywhere else on the island, you could always arrive at the Baia di San Montano by boat. Although you can enter the beach without going to Negombo, the nearby thermal spa, it is an even more relaxing experience if you pay the entrance fee. In addition to the beach, there are thermal pools set inside the mountainside at various temperatures, a few restaurants at various price points, and for additional fees massages and treatments. My friends who recently visited the baia and Negombo said it was the best day of their lives after their wedding and the birth of their daughter. Beat that. You can't.